I continue to have concerns about higher education’s ability to talk about religion. From the embrace of “spirituality” by student affairs to the accreditation of creation-teaching religious schools, the home of our sharpest minds and supposedly most forward-thinking thinkers still seems to have a very conservative and backwards approach to our oldest philosophical questions. It’s like it’s still 1940 and everybody’s afraid they’ll be the next Bertrand Russell—start saying things that are critical (taboo) and you’ll be the next to be unhired. The featured editorial in yesterday’s The Chronicle of Higher Education doesn’t offer much to be optimistic about. The author, Stephen T. Asma, is a philosophy professor at Columbia College Chicago, and you know his article is going to be a farce just from its title: “The New Athe­ists’ Nar­row Worldview.” I’ll give him the benefit of the doubt that he didn’t write the title, but he should complain; an ad hominem attack like “narrow” (an intellectual’s synonym for “stupid”) doesn’t do much to set up the credibility of an argument. Sure enough, Asma’s argument doesn’t have much credibility to preserve and his title is only the beginning of his ad hominem. In fact, his piece covers all the memetic bases when it comes to baseless critiques of atheism. He smears atheists with Marx’s endorsement, then hammers home the stereotype of amorality with Khmer Rouge and Red Guard, stopping just short of Nazism, but not before the damage is done. Ironically, his trite attempt to paint atheism as amoral is supposed to be a critique of Sam Harris’ The Moral Landscape, a book about how we can be moral without religion. Asma’s campaign is as ill-supported as the attack ads he opens with, suggesting that the animism of the Eastern religions keeps the poor, starving people of third-world nations happy, so it’s not a bad thing. Talk about putting the chicken before the egg. Just because animism is lacking in the orthodoxy department, that doesn’t mean it’s any less effective at pacifying the oppressed. And while many of Buddhism’s teachings certainly can be understood and appreciated without any supernatural presuppositions, serving whiskey to the phii/neak ta spirits isn’t helping anybody. As one commenter pointed out, it’s Santa Claus’s cookies for adults. But I’d advance a much more rad­i­cal ar­gu­ment as well. Not only should the more rational and therapeutic elements be distilled from the opi­ate of re­li­gion. But the wacky, su­per­sti­tious, cloud-cuck­oo-land forms of re­li­gion, too, should be cherished and preserved, for those forms of religion some­times do great good for our emo­tion­al lives, even when they com­pro­mise our more-rational lives. In case you weren’t sure whether Asma was really suggesting that opiates—constructed delusions—are a good thing, he makes it quite clear later in the piece: he is. Is an­i­mism a mere “opi­ate,” as the athe­ists ar­gue? Well, yes, but don’t underestimate opi­ates. They can be high­ly in­spi­ra­tion­al and con­sol­ing. Af­ter all, a drunk­en man is usu­al­ly a lit­tle hap­pi­er than a so­ber one. In fact, to con­tin­ue the met­a­phor, op­pos­ing re­li­gion is a lot like pro­hi­bi­tion­ists’ oppos­ing drink­—a rath­er cru­el pro­ject in my view. I’d glad­ly give my copies of Mao’s Little Red Book, and Daw­kins’s The God De­lu­sion for a six-pack of Grolsch. But if all that is too of­fen­sive, we might re­place the word “opi­ate” with “an­al­ge­sic,” and my point may be more a­gree­a­ble. How primal. He ignores the pivotal argument of the very “new atheists” he’s critiquing that you don’t need religion to have comfort or emotional solace or meaning in life. But if religion is the drug, then the new atheism (if something 100+ years strong can be called “new”) isn’t “prohibition”; it’s MADD. Asma’s essentialism is regressive: if it feels good, do it. After all, if you live in the third world, the delusion of other-worldly comforts might be the only good thing you have in your life. But with this condescending argument, he is treating the very symptoms of an unegalitarian world with more of the very systems of control that keep our lives so disparate. Just because we may have evolved a tendency toward belief doesn’t mean that believing is good for us, let alone that we should encourage it. If the brunt of the piece isn’t convincing enough (it shouldn’t be), Asma mixes in some condescending pathos by trying to confirm that there really are no atheists in foxholes. After all, he’s agnostic, but he sure prayed when his son was in the emergency room. How convincing. Even though he knew it wouldn’t help heal his son, he just couldn’t help but grovel and negotiate with something or someone he’s not sure he believes in (or whatever agnostic means to him). This is the model of rationalism we’re supposed to respect? Re­li­gious ideas that en­cour­age de­hu­man­iza­tion, vi­o­lence, and fac­tion­al­ism should be re­formed or di­min­ished, while those that hu­man­ize, con­sole, and in­spire should be fos­tered. What does he think the “new atheists” are trying to do? The whole point of Harris’ book is to “determine human values.” It’s in the subtitle. Asma seems to think that if a good idea is couched in religion, it’s a credit to the religion as opposed to just a credit to the idea itself. Wheth­er it is Ca­thol­i­cism, Protestantism, Is­lam, Bud­dhism, or animism, the vir­tues can be re­tained while the vices are mod­er­at­ed. In short, the re­duc­tion of human suf­fer­ing should be the stand­ard by which we meas­ure ev­ery re­li­gion. Irrationality is a wildcard. You can’t distinguish between the legitimacy of different ideas that are all irrational. Why are dipsomaniacal evil spirits worth any more consideration than an all-seeing god? Are unicorns worth more or less consideration than leprechauns? There is no criteria for differentiating between them, because such analysis requires conformity to the rules of the natural universe in which we live. If the only way you’ve been taught to have meaning in life is to find it through a higher power and you haven’t fully shaken that construct, it’s what you’ll revert to in times of crisis. 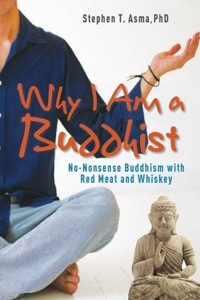 I don’t know what Asma has to say in his book, “Why I Am a Buddhist,” but clearly his claim to agnosticism is merely symbolic, perhaps to suggest that he’s got some expertise as a nonbeliever. (He’s no ally of mine.) If he’s praying (and then playing apologetics for it, as this entire piece seems to be), he hasn’t sufficiently dismantled the only context he’s known. He still finds meaning in life through fear of a great or tiny tyrant, and he’s attacking atheism because he cannot overcome that fear through rationality. “Social agenda” isn’t a very covert form of fear-mongering, especially for atheists, the least-trusted minority in our society. And while there might be much I still don’t know about religion, I’m feeling pretty good that I have a better understanding of it than a nationally-published philosophy professor. I wish I could give higher education the credit. Even though I was triggered by Asma’s piece to write my own response, please also read through all the comments he’s received. Plenty of folks have written some very thoughtful retorts to many of Asma’s points and deserve credit for it. If these anonymous screennames are reading The Chronicle, they hopefully are in higher education themselves, an assumption which does give me hope after the miserable experience of reading Asma’s hackneyed piece. I’d love to know who those people are; they should be the ones featured in The Chronicle.